As you may know, EthosCE is the premier and enterprise-grade LMS designed entirely around CE for the medical profession. We are proud to announce a suite of powerful business intelligence features called EthosCE Analytics. This new part of our platform offers medical education providers unparalleled data management, analytics, and data-driven forecasting features in a single dashboard. One of EthosCE’s most exciting learner intelligence features is self-service reporting and data exploration. With a few clicks, CME Coordinators, Directors, or Executives can generate individual reports that cover the entire timeline of learners’ activities engagement, course completion rates, and LMS browsing history, eliminating the need for manual data handling. Segmented data can also be displayed and shared through embeddable dashboards, allowing CME administrators to have critical data at their fingertips whenever they need it. Reports use elegant, high-impact data visualizations from an expansive template library to make insights simple to grasp and a pleasure to view. Reports may be downloaded, emailed or printed. Not only can these comprehensive reports serve as an evidence-based foundation for the ACCME Self Study, they can also provide a basis for day-to-day resource allocation decisions and user outreach initiatives. Data pulls can also be developed ala carte and included in reports using custom fields. When it comes to data management, new EthosCE Analytics features offer CME Coordinators, Directors, and Executives exceptional transparency in a highly secure environment. In addition, EthosCE’s learner-centric instructional design tools allow course administrators to instantly address users’ educational needs by fine-tuning activities formats at every level with a few clicks. From the introduction of new quizzes and multimedia components to enhance knowledge retention to the removal of individual questions assessments that are problematic for certain learners— instructional designers have complete control over their students’ learning experience. The following fields are required to complete, or “close,” an activity in PARS. Outdated or inaccurate data can corrupt the PARS report, underrepresenting your achievements, or presenting a portrait of learner outcome history that will not stand up under scrutiny. The provider analyzes changes in learners (competence, performance, or patient outcomes) achieved as a result of the overall program’s activities/educational interventions. The provider gathers data or information and conducts a program-based analysis on the degree to which the CME mission of the provider has been met through the conduct of CME activities/educational interventions. For many CME professionals, one of the most difficult challenges in staying compliant is developing a process of evaluation for changes in levels of competence, especially as this information is required for each CME activity. EthosCE removes the guesswork from outcomes evaluation, making changes in levels of competence over time via assessment data and learner feedback through the LMS effortless. While EthosCE has always provided customers with enterprise-grade data management, CME professionals can now develop highly accurate reports on learner outcomes with a few clicks, using the granular insights that can only come from rich data. For more than a decade, EthosCE has worked with medical associations to build CME programs which have helped more than 500 thousand health professionals earn more than 6 million continuing education (CE) credits. CME providers using the all-in-one, user-friendly SaaS will have a complete CME management and LMS solution that brings critical data and curriculum development tasks to a single dashboard. 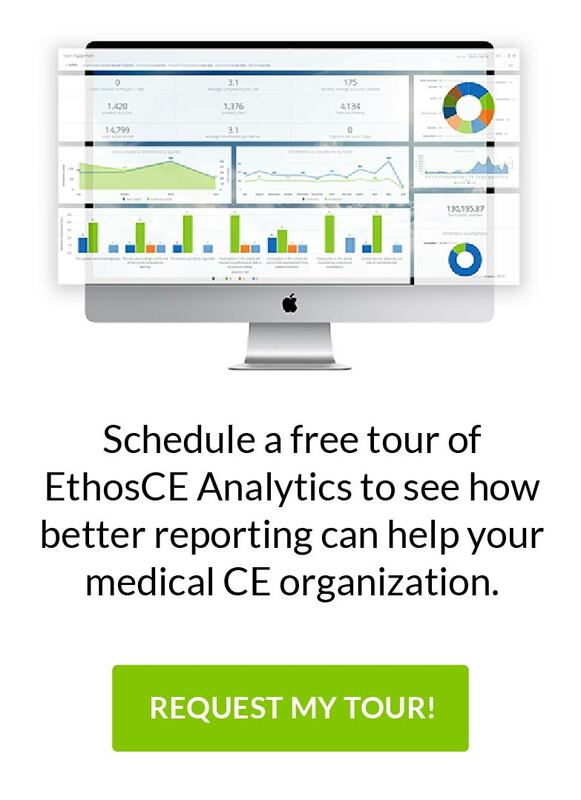 To learn more about EthosCE’s latest analytics and reporting features, click here to request a tour here or schedule a 1-on1 demonstration here!